Boil a pot of water. Once the water is boiling add two eggs and cook for 6 minutes if you want them medium-soft. Cook them longer if you like them hard or cook them shorter if you like them really soft. While the eggs are boiling, mash the avocado. Once the avocado is nicely mashed, add 2/3 of the lemon juice and mix together. Add the hemp hearts to the avocado mixture and stir until blended. Once the avocado mixture is done, set it aside. Pop your two slices of bread into the toaster. While the bread is toasting, wash the arugula and pour or squeeze the remainder of the lime juice on it. Once your toast is ready, place the toast on a plate, spread the avocado mixture on top and place a little bit of arugula on top of the avocado mixture. When the timer goes off for the eggs, remove the pot from heat and fill the pot with cold water to cool off the eggs to stop them from cooking. Remove the eggs from the pot, crack them in half, remove the shells and place on egg on each slice of toast. 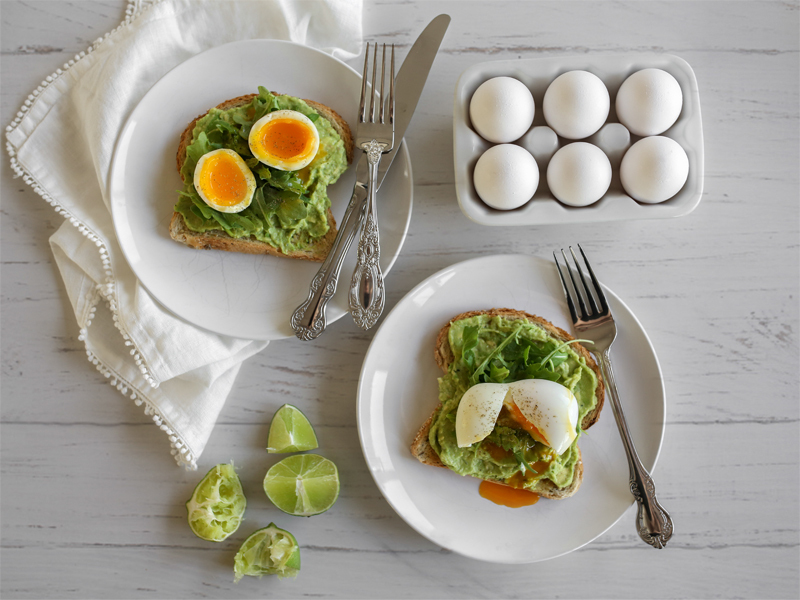 Cut the egg open to let the yolk spill out over the avocado toast.